A young woman holds up the Rainbow Flag at the height of GayFest. The building behind her is Romania’s famous Parliament Palace located in downtown Bucharest. I can’t help but feel that her pose is such a symbolic stance of freedom that the LGBT community in Romania is just really beginning to enjoy. The more media the better. One of the reasons Prides are held is to create public awareness. Media also provides some security as police and protesters sometimes think twice about violent acts when a camera is pointed at them. Both the media and police were very friendly and professional at this event. After Minsk, I felt strange photographing the party atmosphere of GayFest. I think it’s great that this can happen in Romania, and I know that the road here hasn’t been easy. But my thoughts were still with Sergey and everyone back in Belarus. 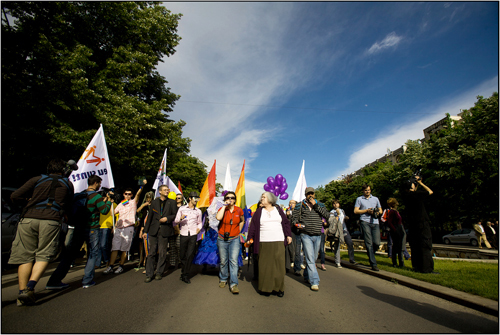 Unfortunately, there was a “Nationalistic” march just hours before the Pride. While this group was very vocal, they were not violent. However, in previous years, arrests were made due to protestors carrying knives, smoke bombs, rocks, and other weapons. Out of all the LGBT groups I have spoken to, not one has said they would deny them the right to march, and the freedom of speech. A “Family Values” march took place the day before the Pride. With Gay Adoption Rights a huge concern for the LGBT community, it brings to question just what values are these traditional families teaching? I saw children no older than 10 carrying signs condemning homosexuals. Hatred and intolerance…nice values. It is always very helpful to have VIPs attend a Pride. If the government is under pressure to protect important guests things are usually much safer for everyone involved. In Bucharest, the gay Rev. Diane Fischer gave a great speech on how God loves everyone, and the British Consulate made their support and presence well known. But despite the VIPs and all of the police protection the march took place along empty streets in almost complete isolation from the general public. It was only in a small park along the very last stretch of the march that a handful of on-lookers gathered and viewed the march from at least 200 meters away. 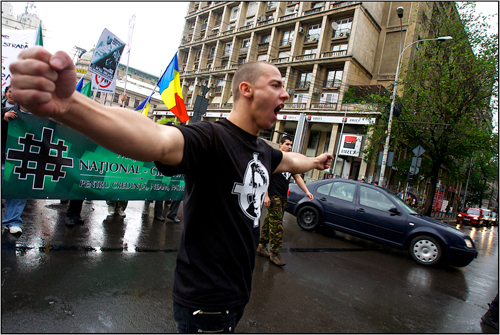 This was in complete contrast to the “Family Values” and “Nationalistic” marches that took place earlier, which made their way through some of the busiest streets in Bucharest. As I was walking home, feeling pretty good about everything here in Romania, a small boy, no older than 8 years old, ran up and handed us a few rolled up pieces of paper. One of them was in English, and is pictured above. I didn’t feel so good anymore. This entry was posted in Romania's GayFest and tagged Bucharest, Gay Fest, GayFest, Romania. Bookmark the permalink.